one sunny morning last week, see what I found? I’m feeling super-sorry for myself. It’s okay, I gave myself permission. I’m going to make a full evening of it, and maybe even eat a big bowl of ice cream in bed. You know, to make myself feel better. Why’s that? You’ll have to ask Zay. It’s all her fault. She’s been waiting, waiting and waiting some more for her calf to be born. Zay’s a funny cow when it comes to babies. Until hers is born, she lurks and trolls around the other mothers’ calves, even going so far as stealing and hiding one last year. Then, once Zay has her own, she’s fine. She’s an excellent mother, but is very private about her top-secret parenting business. Oddly, this year, Zay’s baby was over a month later than the others. Zay laid off the trolling and kidnapping this season, opting instead for being alone, moody and pensive. She spent lots of time laying her bulky self down and gazing off into the distance. She kept getting bigger and bigger, but that baby just didn’t want to come. 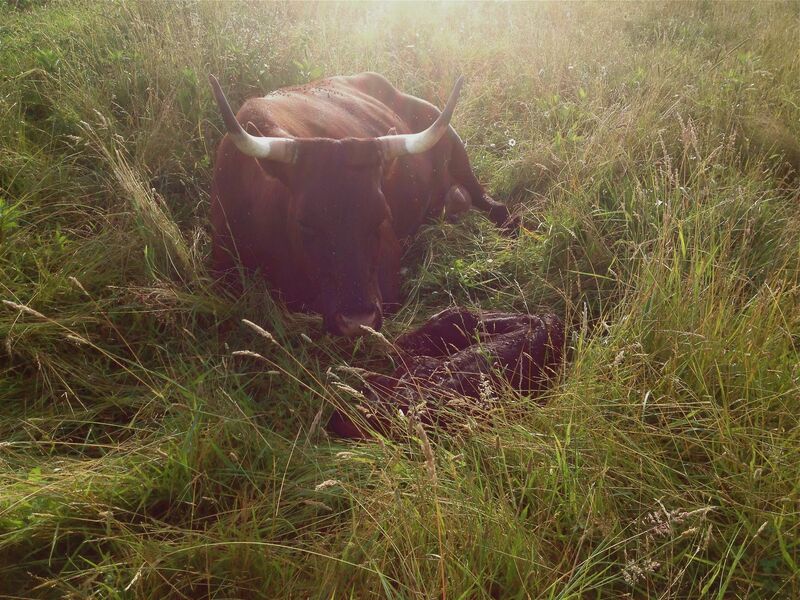 Finally, early one sunny morning, I found him in the tall grass, fed, bathed and curled up beside his mother for his first newborn nap. 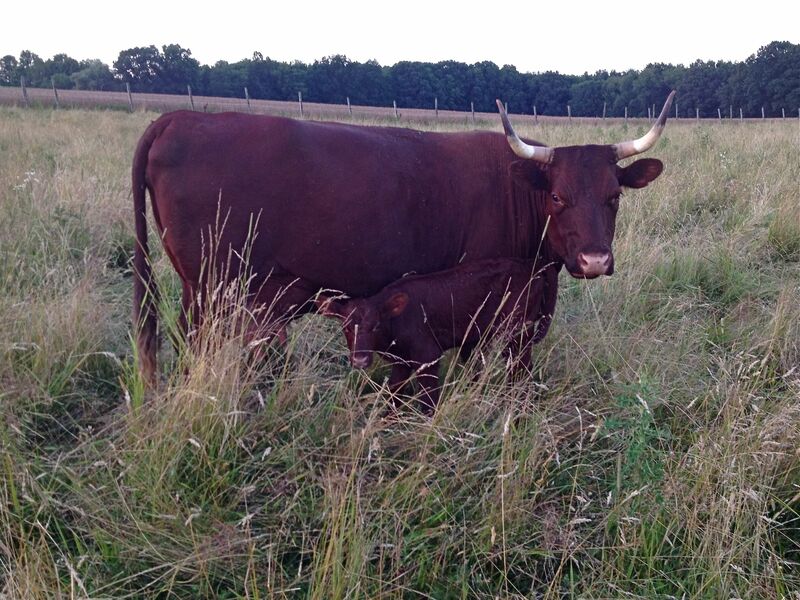 Zay, like the good mother she is, nested in a private corner of the pasture with the little one for several days. Ever dutiful, she left him only briefly now and then for a quick drink of water. Gradually, she rejoined the herd, but as cows sometimes do, Zay tucked the baby into a hidey-hole so she could visit with her friends and do her work alone. Then, when she’s done, Zay goes back and spends the evening with her baby. I was a tiny bit worried last night when I didn’t see the baby, but Zay was completely unconcerned. Zay and I have been through this together a few times now, and I know she’s on top of things. If there was a mishap, surely she would be fretting. But Zay seemed to be a cow without a care in the world. Or a baby either. 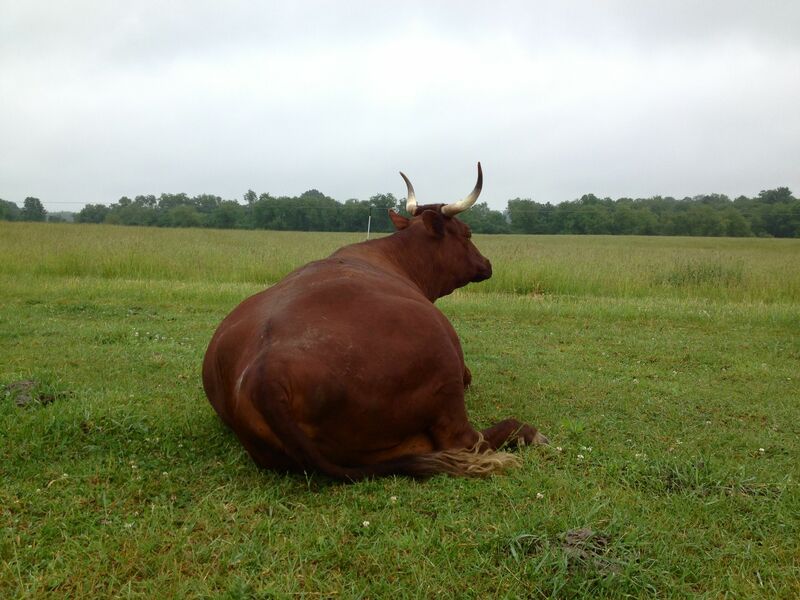 If it wasn’t for her ginormous udder, I’d think she was a single girl. The udder is an important clue: if Zay’s udder was empty, I’d know that even though I couldn’t see the calf, he had eaten. But this was one huge, ready-to-burst udder. When was the last time the baby drank? Come on Zay, I need some clues here! But, as usual, Zay ignored me. She paid no attention as I walked up and down the pasture, crawled under fences and pawed the tall grass. She was unconcerned when I got out the tractor and drove up and down. She enjoyed a leisurely drink and had dinner with her friends. I was getting discouraged. Disheartened. Sad. I was blaming myself for being too busy, and for trusting Zay’s mothering ability. I looked for signs of struggle, circling vultures or other markers of doom. But there were none of those either. Parked inside the pasture on my tractor, I was starting to take it hard. And then, guess what happened next? Suddenly and with purpose, Zay left the herd and walked off to the spot I had combed first on foot, then by tractor just an hour before. She called a few times, and up he popped! He was waiting, not for my noisy self, but for his mother’s call. Zay doesn’t get what all the fuss is about. She had important cow business – geez! Peppy & perky, he bounced up ready for a big supper. I don’t think I have ever been so grateful to see anything, ever. Luckily this tale has a happy ending. Not only did Zaymonster giveth, then taketh back, she gave him to us once again. Whew! Am I supposed to find some deep hidden lesson here? Don’t know, but I surely am grateful. I’ll never doubt you again Zay. Want more about Zay and her kidnapping ways? I know that panic! In the pit of your stomach. We had a missing kid and 5 missing puppies this year. My son found the goat in the garage of all places and the puppies came back on their own after 36hrs! It’s stressful being an animal mom. Thank goodness the little man is just fine. They know what they’re doing. Us, not so much. I think anyone who’s ever looked after livestock has had that awful lurch in the stomach when either we can’t see them or there’s just a hump in the grass that appears too still for comfort. Lucky she hadn’t hidden him so well that you ran him over with the tractor! Glad everything was OK. I know Anne! I thought the same thing! It’s weird how we can search for a calf for hours and not find them until their mother calls. Then they stick their head out of the grass. Great post and a GREAT blog! I will follow so I can come back and read more. Thanks Belmont Rooster, Nice of you to say. I was heartsick that night… I should have trusted the cow more, she’s a good mother. I count the cows every morning and every night. One evening I was late going to the back of the farm to bring the cows up to the front pasture and I thought there was one missing. I must have spent an hour trying to find the missing critter. I went back to where the cows were and counted again. Still one short! Worried somewhat, I told dad (82) that I counted them several times I I thought there was one missing. I asked him how many there were for some kind of reassurance that I was right that there was one missing. He said, “well, there are 4 or 5 cows, 4-5 heifers, 4 or 5 calves, and the new new calf”. That really helped! Sometimes they can be tricky to count when they are moving and a short one is behind a taller one… Maybe at some point I miscounted in the first place. SO, I guess that are all accounted for. I have had to go find the calf more than once. 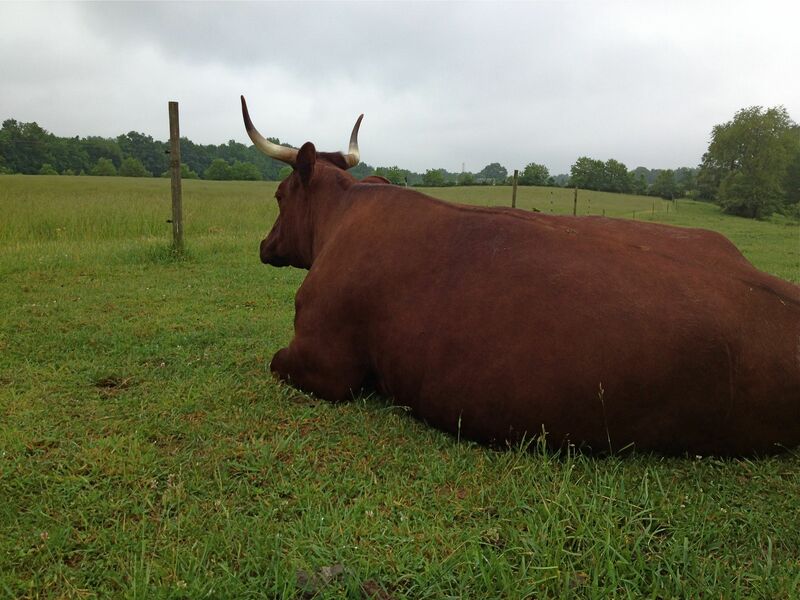 I just look at the cow and she is usually looking toward where it is since we are leaving the pasture. One day, even she was confused. I have another story about that calf, too, but this is not an email.